Myopia is a common refractive error, also known as nearsightedness. Nearsighted people see things best when they are close up but have trouble seeing things that are farther away. Myopia occurs when light entering the eye comes into focus in front of the retina instead of precisely on the retina. This can be caused by a cornea that is too steeply curved, by an eye that is too long, or by a combination of both problems. People with mild to moderate myopia can see things close-up, but people with severe myopia may only be able to see objects clearly when they are just a few inches away. 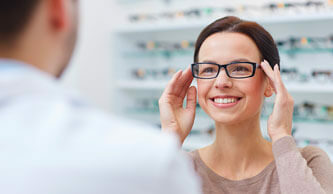 As with other refractive errors, corrective lenses are prescribed to help focus light more effectively on the retina. 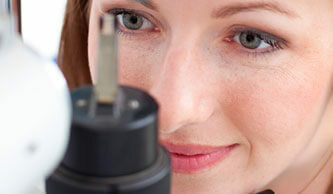 Depending on the degree of myopia, glasses may be needed all the time for clear vision. If the degree of impairment is slight, glasses may be needed only for activities that require distant vision, such as driving or watching TV. Contact lenses are also an excellent option for some myopic patients and should be discussed with your Optometrist. School age children may have vision problems ranging from mild to severe. When problems are suspected, it is important that the child have a comprehensive eye health examination to determine the nature of the problem and to rule out serious eye diseases. When vision conditions are treated properly, the child will enjoy the best possible sight. Also, make the occasion of selecting new frames for lenses a fun time.